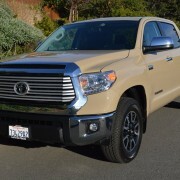 If you want to be transported back in time to the rock ‘n roll Fifties, step way up into the huge Crewmax cab of this Tundra, tune SiriusXM to “Fifties on 5,” then lay hard into the throttle pedal. 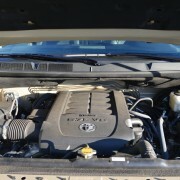 The tune the engine plays is even more evocative than the one issuing from the JBL amplifier and subwoofer. 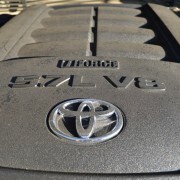 That’s because our test Toyota was fitted with the $1,100 optional “TRD Performance Dual Exhaust System.” This mellifluous addition not only increases horsepower output of the truck’s 5.7 liter V8 to 381hp, but even more importantly endows the big rig with a perfect Fifties vintage Glasspack soundtrack. 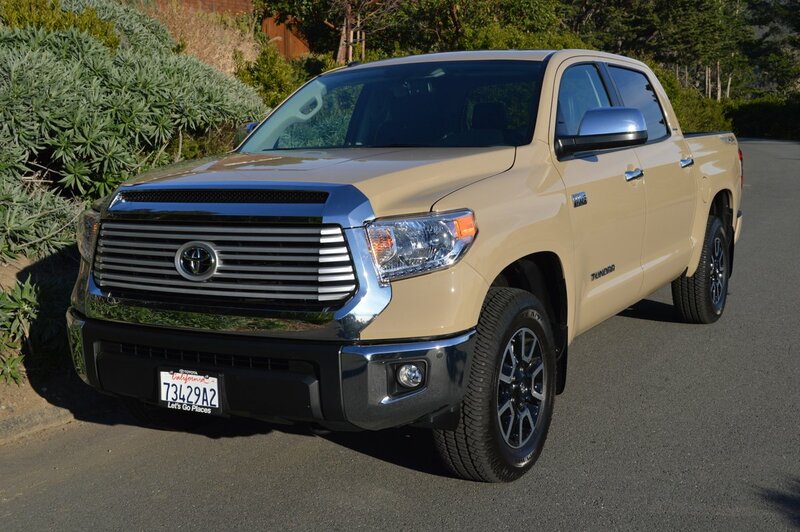 Close your eyes when you’re in the spacious cab, and you will think you’ve time traveled back to a time when bellowing “duals” (twin exhausts) were all the rage. 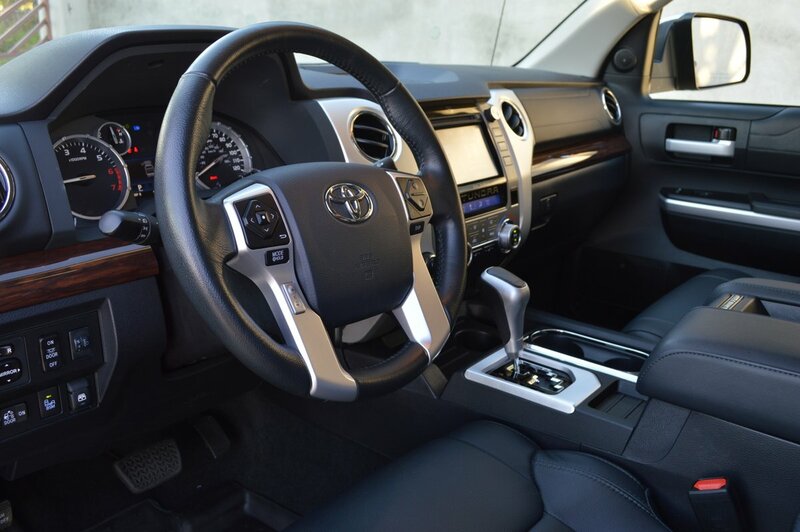 The TRD sound system never gets old, never becomes droning or intrusive. 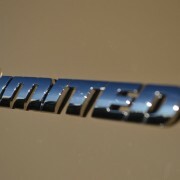 Rather, it constantly reminds you that this is one very powerful V8 that can’t wait to be unleashed. 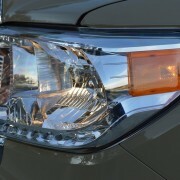 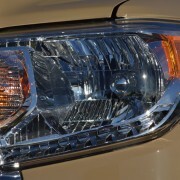 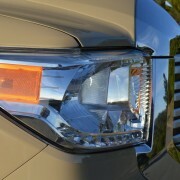 TRD (Toyota Racing Development) makes other significant contributions to this Tundra. 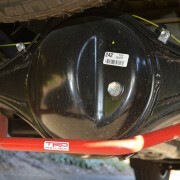 Under the rear end, slung next to the Limited Slip Differential (LSD), you’ll see a bright red steel tube which links the trapezoidal leaf springs of both rear corners together. 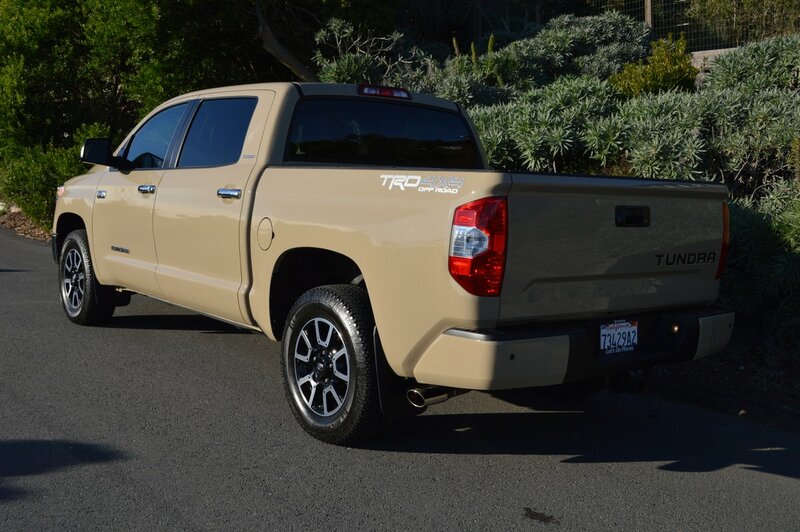 This “TRD rear sway bar” ($299) improves roll resistance when you pitch the truck into a series of turns, as does the staggered mounting of the rear shock absorbers. 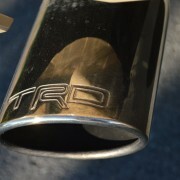 The red rear bar, emblazoned with a white TRD logo, not only looks nasty, but works with the standard front sway bar to eliminate body roll. 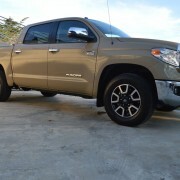 Further TRD enhancements to our Tundra consisted of a “TRD Performance Air Filter” ($75) to improve combustion flow through the special exhaust, a “TRD Skid Plate” ($425), and finally a meaty handful of “TRD Shift Knob” ($150) to position the 6-speed automatic transmission in the desired gear slot (no paddles). 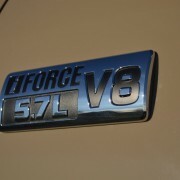 But given the fact that the I-Force V8 musters 401lb.-ft. of torque, pretty much any gear will do, and the transmission’s “Sequential Shift” override function is just icing on the cake. 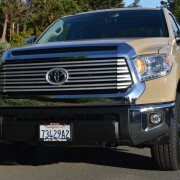 When you lay into this Tundra’s throttle, the truck jumps forward with a wallop of thrust that will drive you backwards well into the heavily padded front seats. 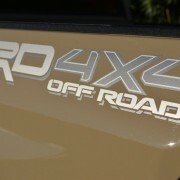 But the most significant TRD equipment is included in the sensationally underpriced “TRD Off-Road Package” ($100). 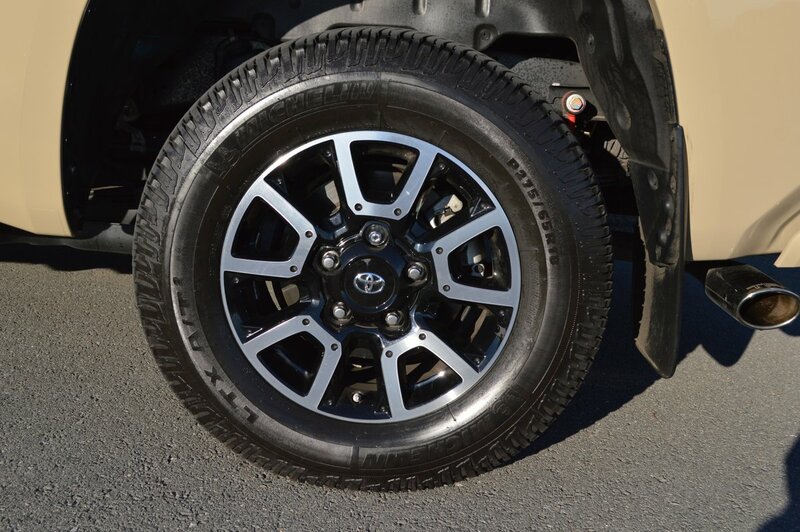 This upgrade replaces the Tundra’s standard 20 inch alloy wheels with 18 inch “Split 5-Spoke Alloy Wheels with Black Accents and All-Terrain P275/65R18 Tires.” Our test truck featured Michelin LTX AT2 rubber that provided tenacious dry road grip. 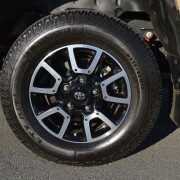 For that extra $100, the Off-Road Package also includes “Trail-Tuned Bilstein Shock Absorbers” at each corner, skid plates for the engine and oversize 38 gallon fuel tank, and a pair of snappy looking TRD Off-Road decals for both sides of the bed. 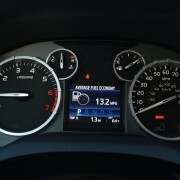 I can’t think of a better way to spend a hundred truck bucks. 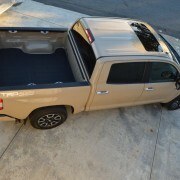 The Crewmax cab configuration leaves bed length at 5′ 6″. 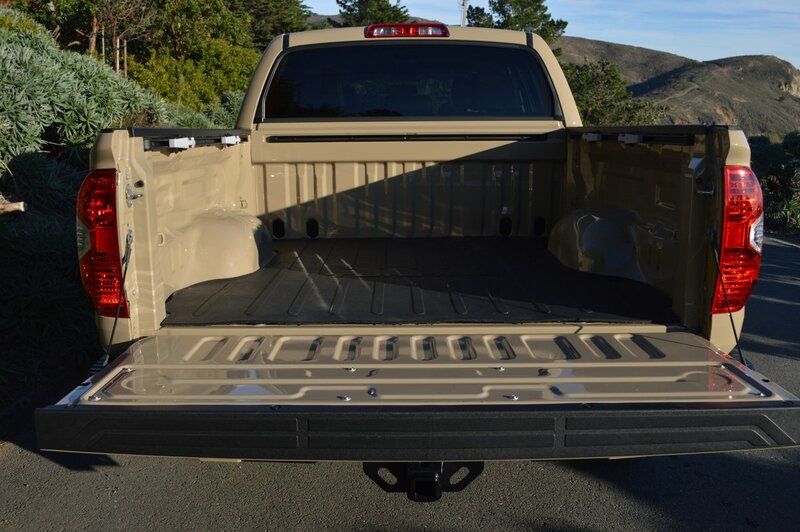 The bed is double walled for strength and impact resistance, and features a $139 optional “Bed Mat” that can be removed for cleaning. 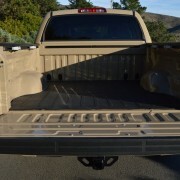 The bed rails feature caps and a rail system with 4 adjustable tie downs finished in gun metal gray. 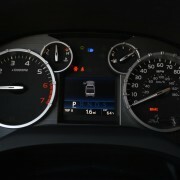 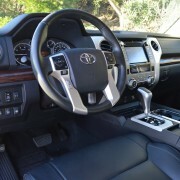 Inside the cab of this “Limited” trim level pickup, you will find all your comfort needs well catered. 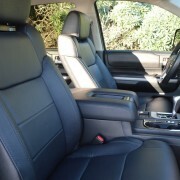 For example, both leather trimmed front chairs are 10-way power adjustable, and provide with 3-stage heaters. 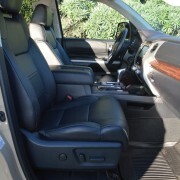 The rear seats, which are split 40/60, both fold up flat to afford a sizeable interior cargo box. 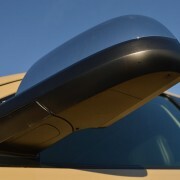 The powered vertical rear window utilizes “Privacy Glass” to keep prying eyes out of your steed. 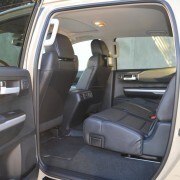 Between the front seats, a very deep storage compartment will hide all your valuable possessions from sight. 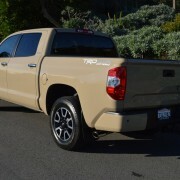 About the only ergonomic shortcoming of this Tundra is the decidedly tall step in height, which would be overcome by fitment of running boards. 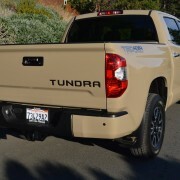 Standard issue on the Tundra 4×4 is a tow package which consists of a receiver hitch, a 4.30:1 rear axle ratio, heavy duty battery and alternator, special coolers for the engine and transmission fluid, and 4 and 7 pin connectors for trailer brakes and lights. 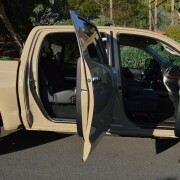 With all the standard equipment and a long list of accessories, including an $850 power sliding Moonroof, the bottom line on this truck still amounted to only $51,486. 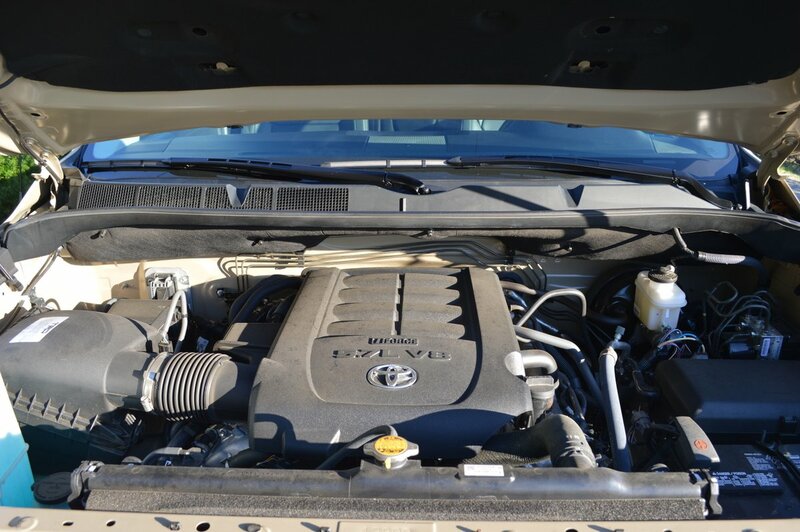 In today’s market, where a top echelon Chevy or Ford can easily run into the $60-70,000 range, this TRD wagon seems like a rational bargain.